When an Etsy craftsperson lists their favourite material to work with as chenille, I know I’m on a winner. There’s lots of special chenille creations at Pinna4piper, as well as many other beautiful, one-of-a-kind pieces made from an eclectic mix of vintage fabrics. While I lingered over the patchwork capes lined with cosy chenille, commonsense made me push on to the summer pieces. 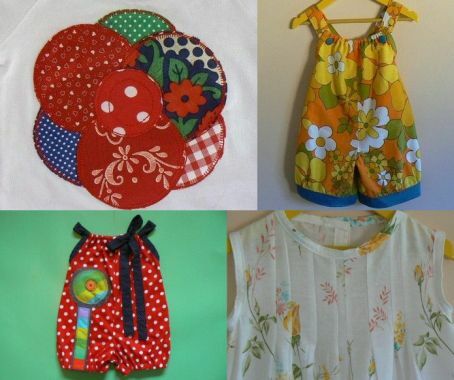 On offer are the coolest lobster-print shorts, a divine yellow and orange floral playsuit and a superb white, flowery dress which has been thoughtfully made to take perfect advantage of the vintage fabric print. As most of the pieces at Pinna4piper are one-offs, it’s best to pop in regularly to see what’s available. 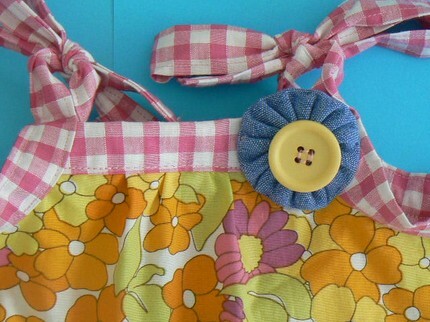 Alternatively, follow what designer Jo is up to on her blog page – it has nice little snippets about her vintage fabric finds (and it’s where I discovered why the yellow and orange floral playsuit looked familiar – the same fabric was on our table, but in aqua and purple, in the seventies). Monkeytail & Wellington also stocks a selected range of Pinna4piper. 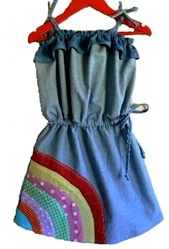 Be sure to check out the retro-chic denim rainbow dress (above).